Cooler Master introduced its first CPU cooler with support for Intel's LGA2011 processors; the Hyper 412S. This new HSF will be available soon for 35EUR, it offers four direct-touch 6mm heatpipes, aluminium fins and a 120mm "long life" sleeve bearing fan that delivers 52.6CFM at a noise level of 22.5dBA. The cooler measures 132mm x 99mm x 160mm and weighs 609g with fan included. Cooler Master, an industry leading chassis, thermal solution, peripheral, and accessory manufacturer brings a new CPU cooler to light, the powerful Hyper 412S CPU Cooler, which targets a delicate balance between cooling potential and noise. The Hyper 412S perform extraordinarily well while maintaining minimal noise levels. End your reliance on other, more time consuming, fan mounts with the included quick-snap brackets. With these brackets, changing, adding, and cleaning fans become a simple task that requires only a few moments of your time. 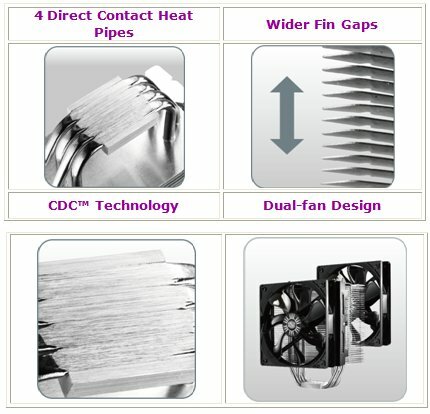 Those with more extreme cooling needs may attach an optional second fan with the extra included quick-snap fan brackets. Whatever the application, the Hyper 412S presents versatile cooling options that tailors noise and performance to any need. Covering all of their bases, Hyper 412S comes ready to mount the latest Intel LGA 2011 and AMD FM1 processors.